The Troy-Bilt Snow Thrower H9777 is a powerhouse, capable of dealing with all but the toughest snow drifts. With a cleaning width of 45 inches. A height of 22 inches this snow blower will outperform most other smaller snow blowers. With an electric start and a 420 cc engine, you have the convenience and power you need. This helps to deal with all that mother nature can throw at you. The Troy Bilt Large Frame Snow Thrower comes with a 16 inch impeller, the largest in Canada, 16 inch augers, 4 16 inch tires and fully tested under arctic conditions. The Troy Bilt Large Frame Snow Thrower is ready to go in minutes, delivered with oil in the engine and assembled in minutes with no tools required. All you need to do is gas up and you are ready to go. This snow thrower is ideal for large areas needing to be cleared of snow and places were you also receive lots of snow. With a cleaning width of 45 inches the Troy Bilt Large Frame Snow Thrower is twice as large as the usual residential snow blower that most consumers will purchase. Having operated a similar sized snow blower, the Troy Bilt Large Frame Snow Thrower will easily handle even the heaviest snow. The trick to using these machines is to let them do the work. Never try to push or pull them yourself. They are just to heavy. Rather you should make good use of your forward and reverse gears along with the steerable wheel drive to turn the snow thrower left or right. The Troy Bilt Large Frame Snow Thrower has been designed with fuel economy in mind, quieter running and cleaner burning engines. The Troy Bilt Large Frame Snow Thrower is a heavy machine and the controls have been set up to allow one hand operation and steering. Let the Troy Bilt Large Frame Snow Thrower do the work. A combination of electric start, single hand controls, remote chute control, dual in dash yard lights, drift cutters, poly slide shoes ready to go low assembly snow thrower makes this machine easy to use for even the toughest snow conditions. Troy-Bilt stands behind its products with a 4 year limited warranty on the Troy Bilt Large Frame Snow Thrower. There are even extra shear bolts included with the Troy Bilt Large Frame Snow Thrower when it is delivered or picked up. Consumers may order the Troy Bilt Large Frame Snow Thrower from one of many dealers that sell this product and arrange for delivery. There may be a cost for delivery however this is also negotiable. Alternately, you can make arrangements to pick up the Troy Bilt Large Frame Snow Thrower with your own trailer at the store nearest your location. The MTD web site has a dealer location service. Snow cover to protect your Troy Bilt Large Frame Snow Thrower from the outside elements. This snow cover is ideal if you must store your snow thrower outdoors. Snow Cab- fits most two stage snow throwers including the Troy Bilt Large Frame Snow Thrower. Provides added protection from wind and blowing snow. Mounting hardware is provided and can be assembled in minutes. 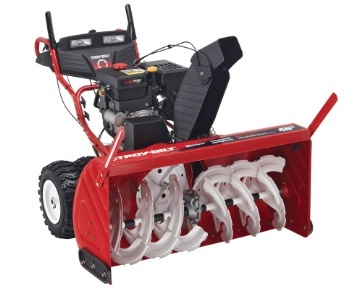 Like all large machines, operators should take care when operating the Troy Bilt Large Frame Snow Thrower. It has a powerful engine and can throw the snow longer distances than most snow throwers. Never aim the snow chute at people, buildings or cars. Chips of ice and sharp objects are discharged at a significant speed potentially damaging anything in its way. Before operating the Troy Bilt Large Frame Snow Thrower for the first time each day, perform a check of all components to make sure there are no loose bolts or loose attachments. Check the auger and the impeller for signs of frozen ice. Check the oil level in the engine and the fuel level in the gas tank. Top up as required. Follow all recommended safety precautions in the manual. Consult the manual for instructions on basic maintenance requirements as well as safety concerns when performing maintenance on the Troy Bilt Large Frame Snow Thrower. Never conduct maintenance on a Troy Bilt Large Frame Snow Thrower or any other snow blower with the engine running. Always shut the engine off and then perform required maintenance. If you need to clear the auger or the impeller of ice or snow , again shut the engine off first. Change the engine oil according to the instructions contained in the manual and at least on a annual basis to protect your investment and ensure a long life for your Troy Bilt Large Frame Snow Thrower. Heavy use of the Troy Bilt Large Frame Snow Thrower may require oil changes more often as recommended by the manufacturer.